RANLife Home Loans hosts a food and donation drive every year for the Utah Food Bank and today is day one of our drive. For the past 100 years, the Utah Food Bank has fought hunger statewide and works timelessly to make an impact here in our community. This year, you can help too. During the holiday season, we usually reflect on our lives and how fortunate we are to have everything we do and we tend to open our hearts. Donating to the food bank is a great way to give to those that are less fortunate during this special time of year. For every $1 donated to Utah Food Bank they are able to turn that into $8 worth of goods and services. For a $1 donation they can acquire 4.20 pounds of food. Your support of our Food Drive is how they are able to purchase many of their most needed items at a greatly discounted price. 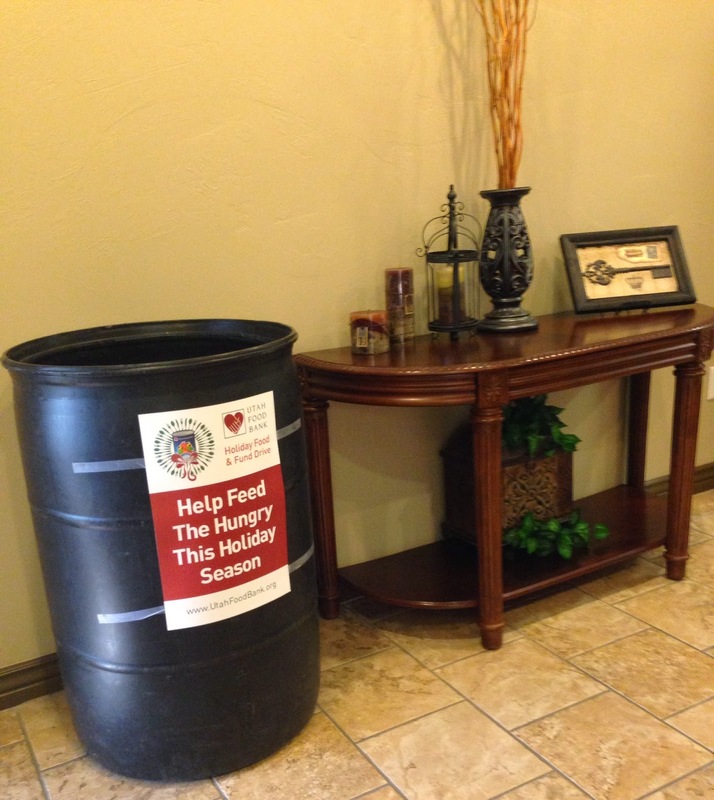 We have bins around our office for any non-perishable food items you would like to donate. A great way to make room in your pantry for everything Thanksgiving dinner related, is to clean it out and bring in some donations. Our office is located in downtown, Salt Lake City and the address is 268 W. 400 S. A map with directions is located below. The easiest way to participate is to donate food and cash through the virtual food drive. Not only does that provide you the convenience of saving time, energy, and gas by not having to drive downtown to our Salt Lake Office it will also make your donations go further for each dollar spent. That's because food items can be bought online at deep discounts over grocery store prices. That means that you can donate a lot more food for the same or less money!. You're donation goes even further if you donate cash directly through the virtual food drive. Utah Food Bank is able to procure $7 worth of food for every $1 in cash donations. 2. Physical drop off: 268 W 400 S, 3rd Floor, Salt Lake City, UT 84101. Hours: M-F, 9:00 a.m. to 5:00 p.m.. Dates: November 26th through December 31st. Phone: 800.461.4152. Due to these difficult economic times, 472,000 Utahns are at risk of missing one meal a day. It is because of our community and generosity that the Food Bank is able to make a difference. We thank you in advance for your support and generosity.